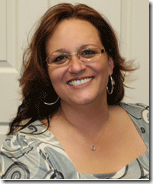 My name is Shawna Seigel and I am the owner of 1 Choice 4 Quilting. I started my first business out of my living room 11 years ago. I was a single mother who had left an abusive relationship and was just trying to survive. At the time, there was not enough information on the web on how to really grow my new online business. Everyone wanted you pay for it. I didn’t have the money. I did the only thing I could do. I started learning on my own! 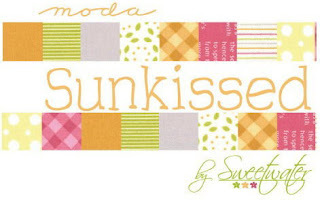 I started helping other moms in my situation and started my own company helping people build their own online stores. Well one day I found myself sitting at a major conference absolutely LOVING the education I was getting. I wish I had that education available to me years prior. There was no way I could have done it. It cost $2,000 to get in the door, $400 for the flight, $200-$300 a NIGHT for the hotel, and other expenses. Don’t get me wrong, the education was WORTH IT. As I looked around the room at that moment, I realized I had to find a way to bring that same quality education to that single mother working at home, in her living room, with her 2 boys, after leaving a husband with nothing but their clothes. How could I help her get the same education NOW? How could I help the small business owner who works all week and then works nights and weekends on their website the same quality education? How could I help someone disabled to get the same education? How do I bring this education to everyone? That’s when it hit me. We will hold an event online. We will make it free. We are now holding our FOURTH event THIS weekend!! It's called The New Life Event. So why am I telling you this information? I know there are many mothers, grandmothers, sisters, daughters, and a few men too that read this blog that have their own website. I hope that you will hear my story and realize that you can have your own online website and be successful. You just need the right education. Well, the right education is THIS weekend. Tonight I am hosting what I call an Online Cocktail Party. I will be explaining everything involved with the New Life Event and how you can get great education along with some amazing prizes this weekend. I will also be hosting and speaking at the New Life Event this weekend. I hope to see you there! If you know someone that has their own business or would like to open an online business, please pass on this information. My goal is to help as many people as we can! I have exciting news! This coming weekend I am hosting an online event called The New Life Event. It is super cool and it is all about giving back. Cara from CaraQuilts is giving back too with her Charity Challenge and I will be interviewing her at 6:00 PM Eastern on my radio show Ecom Experts. You will have tons of fun and meet new friends too! We are absolutely in love with Sunkissed Fabrics by Sweetwater. So much so that we want to give some to you to help celebrate our Grand Opening Month! 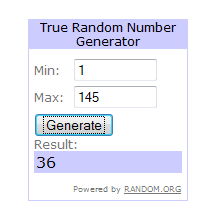 Since the giveaway ends on my birthday, I think we should have TWO winners and not just one! 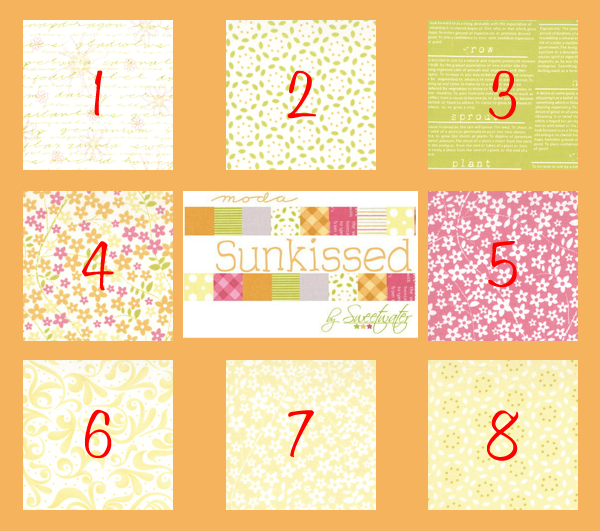 The first row is called Limeaid, the 2nd row has bright colorful pieces to throw in, and the 3rd row is called Lemonade. They are all GORGEOUS. Mix and match or get them all. 1. Answer the following question by leaving a comment on below - Which one do you want to win? Four 1 yard cuts or eight 1/2 yards of each? 2. If you decide to follow our blog (left column under what's new) or you already do follow us, leave us another comment letting us know you have. 3. If you decide to Follow us on Twitter or you already do, leave us another comment letting us know you have. 4. If you decide to head over to our Facebook page and click on the Like Button (OR use the toolbar below). Then leave us another comment letting us know you did! 5. If you decide to blog about our giveaway and tell all of your friends, please leave us a comment letting us know you did with the URL of your blog post. This REALLY helps us spread the word about our Grand Opening and we appreciate this so very much! 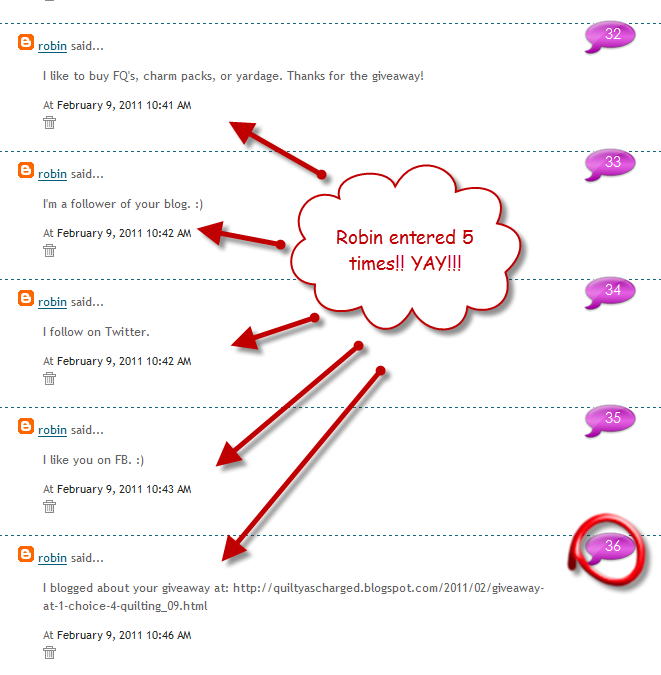 Giveaway closes at 10PM Eastern Monday February 28th, 2011. Don't forget - Everything in our store is STILL 20% off! This is an awesome special but, hurry and order! Our stock is flying off the shelves. P.S. Sign up for our newsletter for special offers and chances to win more prizes! Who was lucky number 36?? Robin entered our contest 5 separate times giving her the most chances to win - and it worked! Congrats Robin! Please click on the contact us link above so we can send you your beautiful kit! If you would prefer a different color, just let us know! Thank you everyone for entering our contest and make sure to check back this weekend when we start our next giveaway. It will be one you do NOT want to miss. Let me give you a hint.... Sunkissed. 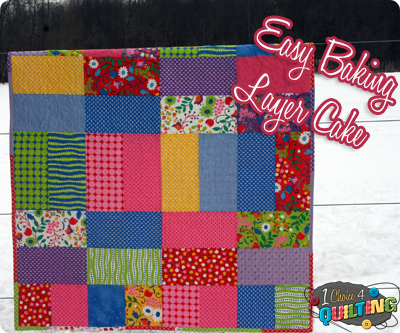 Honestly, I should have called this "Super Fast and Easy Baking Layer Cake Quilt." I had to make TWO of these fast for my twin granddaughters. 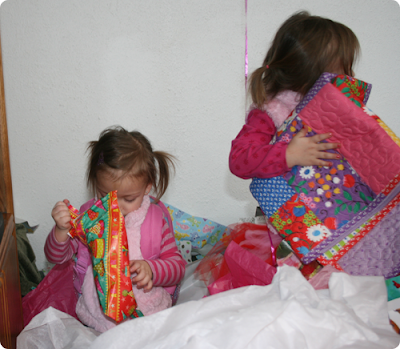 They were turning 3 and I wanted to create something special for them. But, I had to do something FAST. Thankfully I was able to create each quilt tops in just 2 hours! Kayla is more of a Girlie Girl kind of girl. But my Kyliee has a bit of tomboy in her. 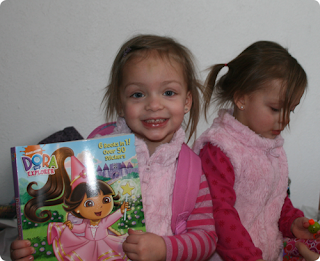 If you would like a kit, we have a Hoopla and Girlie Girl Kits available at a special price! Plus, you still have time to enter our giveaway and win a Robert Kaufman Quilt Kit. 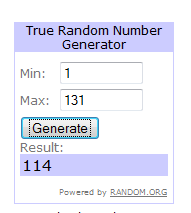 As Promised - Another Giveaway to Celebrate Our Grand Opening! Giveaway is Closed sorry. Join our Facebook Page for updates on our next Giveaway! We are having so much fun celebrating our Grand Opening that we are doing another giveaway! 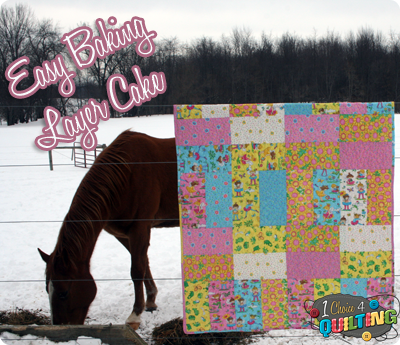 This time we are giving away one Radiant Butterfly Quilt Kit in Ivy Featuring Chop Chop by Cottage Quilt Designs for Robert Kaufman 50 x 50. 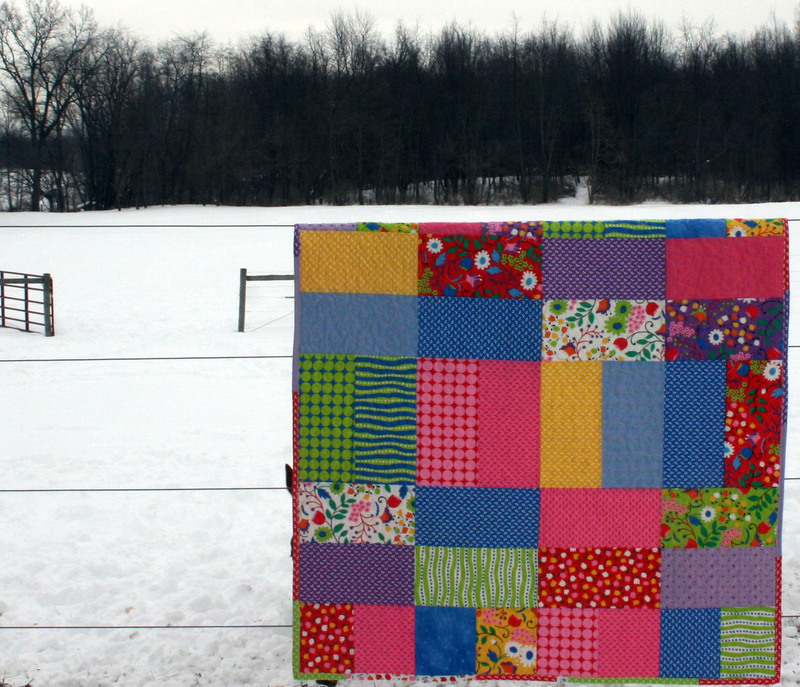 This will make a GORGEOUS Quilt!! PLUS - everything in our store is STILL 20% off! This is an awesome special but, hurry and order! Our stock is flying off the shelves. We have TONS of inventory to add to our store still but, we have been too busy packing orders :) We will get them up as soon as possible! Then get ready to enter our giveaway! 1. Answer the following question by leaving a comment on below - How do you like to buy fabric for your quilts? Bundles, Jelly Rolls, Charm Packs, Layer Cakes, Kits, or by the yard? Your answers will help us serve you better! 5. If you decide to blog about our giveaway and tell all of your friends, please leave us a another comment letting us know you did with the URL of your blog post. This REALLY helps us spread the word about our Grand Opening and we appreciate this so very much! We will pick the winner Wednesday February 16th at 8:00 PM Eastern PLUS we will have one final GRAND Grand Opening Giveaway after that one! Make sure you are signed up for our newsletter so you don't miss out! Good luck everyone and have fun shopping! We are now set up to accept all credit card and Paypal as well. I will be sending out a special newsletter later today - make sure you are on our list!! Stay tuned for more details and thank you again! Oh and I had to show you this really quick because it was so SUPER cute! In a few days I will create a tutorial and kit for these quilts. 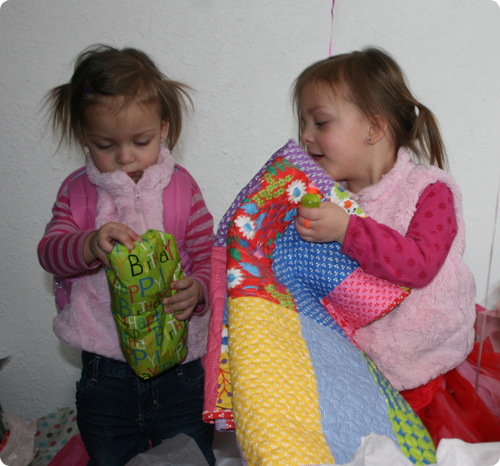 They go together SUPER fast, they are toddler size 48" x 36," and guaranteed to make anyone smile! Oh yeah, ignore the horse Diego. He HAS to be in every shot. Notice the ear peaking out? Yep, that's him too! I am so excited to announce our first winner!! You have all made me smile, made me laugh, and brought happy tears to my eyes too. WOW! Gorgeous :) Can't wait to see what Terrie creates and hope she shares pictures with all of us. 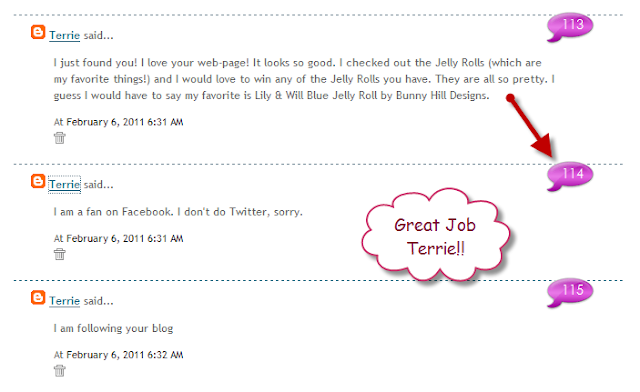 Plus, make sure to check out Terrie's blog. Great info on half square triangles!! Thank you every one for entering our giveaway and make sure you join us for our next one! Forget the Coupons - Everything is Marked 20% Off! We wanted you to celebrate our Grand Opening with awesome specials. So... we marked down everything 10% and gave you a coupon code for an additional 10% off. We marked down everything 20% off instead. Have fun shopping and thank you for celebrating our Grand Opening with us!! Don't forget that we have an awesome giveaway going on RIGHT NOW! Grand Opening Giveaway All Month Long PLUS Amazing Specials! 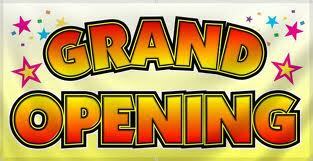 We are so excited about our Grand Opening, we are GIVING AWAY fabric the entire month of February! Yes, you heard it right. We are giving away jelly rolls, layer cakes, and charm packs too all month long. 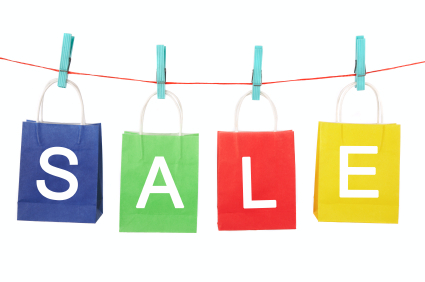 PLUS - everything in our store is 10% off. PLUS - During the month of February we are giving you a coupon for an EXTRA 10% off using coupon code 1c4yq2011 - That's 20% off!! **Update**Too many customers had a hard time with the coupon. So screw the extra coupon. 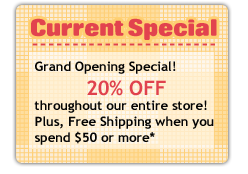 Everything in the store is marked down 20% for our Grand Opening!!! PLUS - During the month of February we are giving you a free gift just for making a purchase! Just remember, we are still adding new products DAILY and to come back often! We have TONS of inventory to add to our store still but, we wanted to get our store opened right away! 2. Follow our blog (left column under what's new) and leave us a comment letting us know you have. 3. Follow us on Twitter and leave us a comment letting us know you have. 4. Head on over to our brand new Facebook page and click on the Like Button OR use the Facebook box on the left. Then leave us a comment letting us know you did! 5. Blog about our giveaway and tell all of your friends. Leave us a comment letting us know you did and the URL of your blog post. We will pick the winner Monday February 7th at 8:00 PM Eastern PLUS on Tuesday February 8th we will start the process again! This contest has ended sorry :( Please check our blog for future giveaways and make sure you are connected with us on Facebook and Twitter! 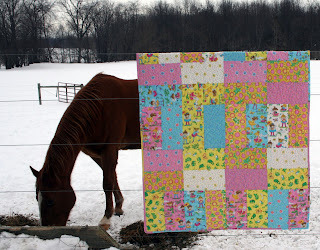 Hello and thank you for visiting the 1 Choice 4 Quilting Blog. We are still in the process of setting things up and will have this blog up very shortly!